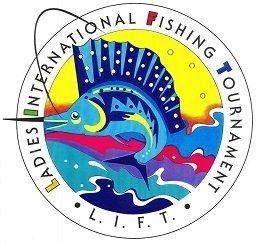 One of San Carlos’ many popular fishing tournaments, the 26th Annual Ladies International Fishing Tournament takes place on May 24 – 26, 2019 (Memorial weekend). Registration is on Friday, May 24 from 5:00pm to 7:00pm at San Carlos Yacht Club. Fishing Days are on Saturday, May 25 and Sunday, May 26. The Awards Dinner takes place on Sunday, May 26 at 6:00pm at TBA (the San Carlos Yacht Club?). The Entry Fee is $75 USD which includes the awards dinner and a gift. Pre-register here. For Anglers / Boats that pre-register prior to May 18, the angler or boat name will be put on their tournament souvenir shirts. 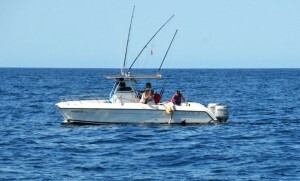 Basic Rules: Mexican law requires a fishing licenses. This is a lure only event – no live or dead bait permitted. Billfish are catch and release only. For more information, contact Kathy Rodgers at karodge@earthlink.net or 622-120-7869. May 26 – 28, 2017: The Ladies International Fishing Tournament was Memorial Weekend with 18 boats and 35 anglers. There were 5 billfish released. Vi West with Captain Mike on Catch-a-Lotta took first with the first release. A 7.4 pound dorado was the largest weighed. The Kryptonite, owned by Wade Earl, was the boat with the most points in the tournament. Reel Mistress either used their good network of connections again or went off some good intuition to get their lady angler 10 sails and a marlin on lures on Sunday in the LIFT (LIFT winner, Tamra Williamson from Reel Mistress pictured). This is by far a record for the tournament, even for both days. A few boats had two releases on Day One. I am sure they were biting nails hearing Reel Mistress calling in fish after fish on Sunday. There are whales and dolphin all over. Enjoy the ‘cool’ air while it lasts, and take a dip in the clear blue 80 degree water after that big battle! Things are heating up in San Carlos, but we are keeping our cool. It was a beautiful day on the water today without the crowds. I was able to fish my way again, with bait, and it was ON! 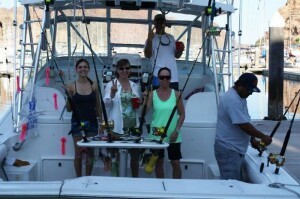 Six sails, a marlin, and a dorado were caught for dinner. Just a few of us were on the boat, so we had our fun when a pack of over six sailfish was attacking all of our eight lines. We had others on that got off, but we still caught plenty. The fish were jumping all over and only a few miles out. All we needed was something to eat in the end, and before I had to bring out the deep divers for Sierra, we got a nice dorado. That will hopefully replenish them from all the billfish battles. There’s nothing like catching your first billfish, and then three more. There is beautiful blue water pushing in almost to shore out there. The temperatures are between 77 – 81 degrees. There are lots of dolphin, and we spotted some whales at times, and turtles, mantas, and a variety of sharks – some 10 – 11 feet. The small dorado are almost a nuisance at times. The big ones still sound a ways off, but they will come. There are lots of marlin in close, and today it sounded like the billfish were showing on the Reef too. Outside the reef and farther out, and especially around large weed patches, there were good numbers of dorado. 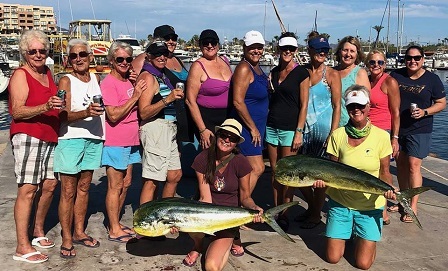 Some dorado weighing up to 23 pounds were caught in the Ladies International Fishing Tournament Memorial Day weekend. I believe around eight fish made the 15 pound ‘weighable’ status. I’m sure that several hundred small ones were caught, with most of them released. I sure enjoy tasting that great mahi mahi again though! There were no wahoo, but a couple of super small ‘football’ tuna were caught. Fifty-seven anglers fished from 27 boats for the two-day tournament. Vi Traynor on Costa Lotta with Captain Mike took First Place with three sailfish releases and a weighable dorado. 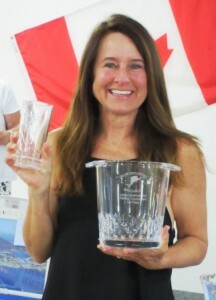 Close behind was Susan Frost on Border Bandit with a marlin and two sails, and Third Place went to Dana Cryer on Reel Loco with two sail releases. The fish were biting, but often not sticking, as Team Kryptonite must have gone 0 for 24 on Sunday. We had a long tournament too on Telamon until our lady angler Tammi Goldring got her first marlin before the end of the last day. They sure can put up a fight. It was great to get out with the ladies for this lure’s only tournament, but bait fishing with circle hooks is the way to go. There are healthy releases on light tackle. 1.- Jackie Carpenter … Two C’s … 500 points. 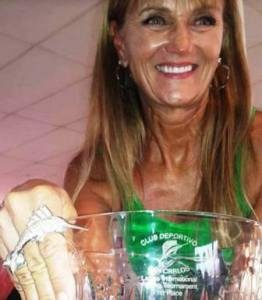 2.- Danni Earl … Kryptonite … 419.2 points. 3.- Vi West … Costa Lotta … 400 points. 4.- Pat Walsh … Alaska Bill … 400 points. 5.- Linda Pringle … Flying Low … 400 points.